Amazon released Kindle version 2.3 in the App Store and on iTunes. The latest version includes: Books display in two columns when reading in landscape orientation on iPad. Book Extras including character lists, plot summaries, and series information are available for many popular books. Book Extras are powered by the Shelfari.com community and can be accessed from the Go To menu while reading. Bug fixes that improve app stability. (see below). • Book Extras including character lists, plot summaries, and series information are available for many popular books. Book Extras are powered by the Shelfari.com community and can be accessed from the Go To menu while reading. Requirements:Compatible with iPhone, iPod touch, and iPad. Requires iPhone OS 3.0 or later. 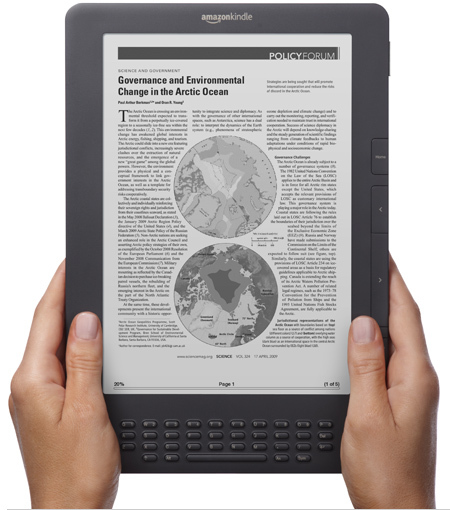 Amazon will be releasing the new Kindle DX Graphite on July 7th. The cost is now only $379 for the new and improved Kindle DX. The latest Kindle DX features a graphite colored body, 50% better contrast, Twitter/Facebook integration and it looks like real paper. Amazon is taking pre-orders now. More information below. Long Battery Life: Read for up to 1 week on a single charge with wireless on. Turn wireless off and read for up to two weeks. Large Selection: Over 620,000 books and the largest selection of the most popular books people want to read, including 109 of 112 New York Times® Best Sellers, plus U.S. and international newspapers, magazines, and blogs. For non-U.S. customers, content availability and pricing will vary. Check your country. Amazon releases their Kindle App today in the Android Market. Kindle is a free application for your Android phone. Access and read books from your phone. The application requires Android OS 1.6 or higher.